Aspen pads have a lower efficiency rating than cellulose media like CELdek or GLASdek. Aspen pads have been referred to over the years as cooling media, excelsior pads, evaporative cooler pads or swamp cooler pads. Aspen Pads are typically discarded and replaced annually, usually at the beginning of the cooling season. Residential, commercial, industrial and agricultural application of aspen cooler pads has diminished over that past 20 years due to the growing need for longer pad life and a desire for lower seasonal maintenance and high efficiency evaporative cooling offered by CELdek and GLASdek evaporative cooler pads. If properly maintained, ridged cellulose media like CELdek and GLASdek should last multiple seasons. Owners who desire the increased benefits that CELdek and GLASdek can provide such as high evaporative efficiency, longer pad life and lower seasonal maintenance are choosing to replace their old aspen units with CELdek and GLASdek evaporative cooling units. Because CELdek and GLASdek units typically use 8” to 24” thick pads vs. aspen pads of 1” to 2” there is not enough room in the unit for a direct conversion. 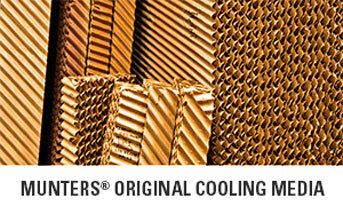 CoolingMedia.com is a division of United Metal Products, Inc. which manufactures a full line of Fan-Air® and Cel-Air® Commercial/Industrial Evaporative Coolers that utilize CELdek and GLASdek media. For owners who wish to continue their use of Aspen Coolers, United Metal Products, Inc. also manufactures Fan-Air® Commercial/Industrial Evaporative Coolers. Water flow needed is based on the width and height of the media used. Make sure that the slots in the top of the pad frame that distribute the water are free from mineral deposits or debris and allow water to flow freely and evenly over the entire pad area. Restrictions in the flow of water across the pad will result in increase scaling and “hot spots”, which will lower the efficiency of the evaporative cooler. Mineral deposits can be minimized by maintaining a continuous water bleed-off, or by periodically dumping the sump. The exact amount will depend on the pH and hardness of the supply water. If algae is allowed to grow freely on Aspen Pad it may eventually clog the passages and inhibit the flow of air. This increases the static pressure and reduces the efficiency of the pad. Algae build up can be controlled by early implementation of simple maintenance techniques such as eliminating the nutrients and sunlight that algae need to grow and to help maximize the efficiency and life of Aspen Pads.